Many have come to know Ram Dass by way of his breakout bestseller, Be Here Now, which he wrote about and after his time spent in India, in the divine company of his Guru, Neem Karoli Baba. 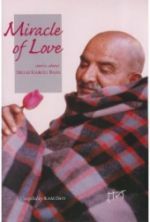 Miracle of Love is a compilation of stories and lilas, written and spoken by scores of disciples and devotees of this great Master, as well as accounts collected from seekers and travelers from all walks of life, ones who had the great blessing of being in the company of this renowned Saint. The stories are at once compelling, intriguing, varied, and often entertaining, as the reader gets quite an insider’s look at (and vicarious experience of) all the magic and wonder that happens in the presence and company of saints, this one in particular. Himself an embodiment of Hanuman (the Hindu deity known as the embodiment of devotion, and celebrated for his devotion to his Master, Rama), it is no wonder that so much of Neem Karoli Baba’s life and message was to inspire in others that same fathomless level of devotion to God and Guru. What is most fascinating about Neem Karoli Baba is his utter simplicity. Spending much of his time sitting upon his “tucket,” devotees would surround him and drink of the love he emanated, all the while becoming more and more devoted to him… thereby to God… and ultimately to self—the whole meaning, magic, and purpose of devotion. This book is itself a lesson and training in the Art of Devotion. Those who choose to see devotion as an act of weakness have yet to discover why Bhakti yoga is the highest—and fastest—path to God-realization. Why is that? Simply put: Devotion is quickest path to self-love, and the journey to God-realization is the journey into absolute and total, unconditional love of and for all aspects of self. And it is by our devotion to another (and all others) that we master loving ourselves. Add to that the fact that, when your gaze and devotion is directed at a God-realized being, you are receiving the darshan of that one (his blessing, which is an infusion of his actual God-vibration), you are receiving a direct transference of spiritual power, and you are accelerating your soul’s evolution faster than by any other means available to humankind. Reading this book will change the way many people see the act of devotion. It is my intention and hope that, by reading this (and other books by and about fully God-realized Masters), you will find greater strength, inspiration, encouragement, and will become smitten with a newfound love of God. Most of all, may you discover the true spiritual power and myriad benefits to be gained through the selfless and masterful practice of devotion.